The Quickest and easiest way to get a UK Sick/Fit Note. Order a sick note on this page and receive delivery of your sick note within the next 48 hours. See below for how your doctors sick note may look. These have been deliberately smudged and distorted, but you'll be able to see behind this- these are 100% the real thing. Cost is just £10.99 (includes P&P). What type of sick note is for sale on this page? 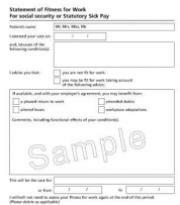 If you miss work your employer may demand a doctor’s certificate and will have to attend the doctor to get a Department of Social Security sick note, a “Med 3/Sick-Fit Note”. The type of sick note is the standard UK sick note (great for explaining sick days); and after you pay, you can chose to receive a computer generated sick note (standard since January 2013) or a hand-written sick note (often used in hospitals, and surgeries with older IT systems). You will be receiving a Med 3 10/17 - the current version of the sick note in the UK. This sick note can also be used to explain absences from University/College or explaining you are unfit to travel. Standard Delivery Time for this product: Same day by email, physical delivery 2 working days.